In the presidential election, Donald Trump beat Hillary Clinton by 26 percentage points in Tennessee. It is Trump country. So what do Tennessee voters say about illegal immigration? 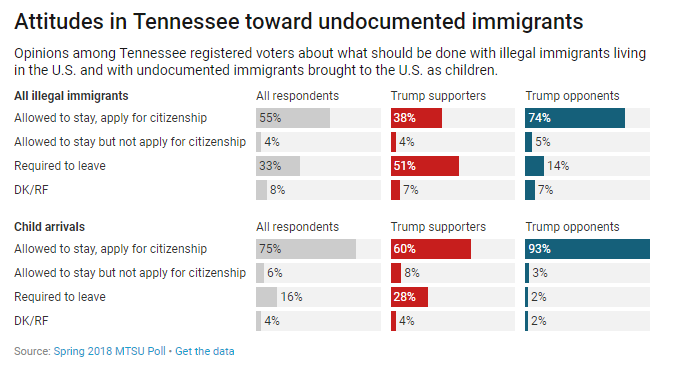 Incredibly, only 1/3 of Tennessee registered voters think undocumented immigrants in general -- the 11 million of them -- should be required to leave the US. Even Trump supporters only seek deportation by 1 percentage point. Notwithstanding ICE raids here or there, the public does not support any large scale removal of undocumented aliens. And that's in Trump country. As for those 3.6 million child arrivals (DACA + Dreamer eligible), only 28% of Trump supporters want to deport them, and only 16% of all registered Tennessee voters. So, to my conservative friends, here's the reality: You don't have the votes. Not even among Trump supporters. If conservatives do not come up with a more creative approach, count on the DACA eligible, and very possibly the Dreamers, to be grandfathered in after the November elections, exactly as President Trump recently signed an omnibus bill which he himself disavowed. The rationale will be exactly the same as in 1986: a granting of amnesty in return for promises of border enforcement which will never come. So if you're a conservative, you'd better start looking fast for Plan B, something which gets you much of what you want and will still be supported by a broader electoral coalition.